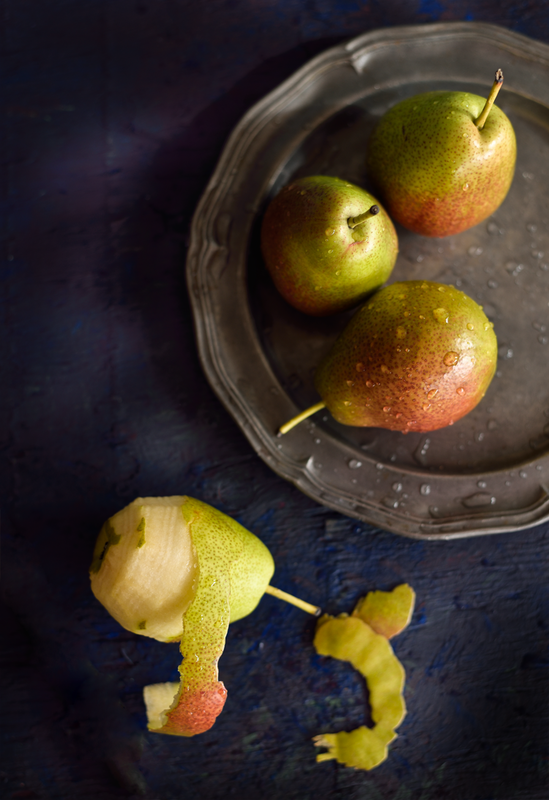 Poached pears is a great breakfast idea for the holidays, goes so well with french toast. Hot french toast with poached pears and vanilla ice-cream. ahhhh…..this is life. When I posted the first image on Facebook, one of my friend commented “calories for the soul “ I love the phrase. Thanks Rumki for your beautiful words, I have added that as text on the last image, hope you like it. I forgot to mention it in my last blogpost, I now have a portfolio site, to showcase my work. It’s a work in progress, any suggestions are welcome. I still have to write an ‘about me’…..postponed that forever, I really don’t know what to write. I hope I come up with something. You can use ready mango pulp if mango is not in season, like I did. Mix sugar, water saffron and cloves and bring to boil. 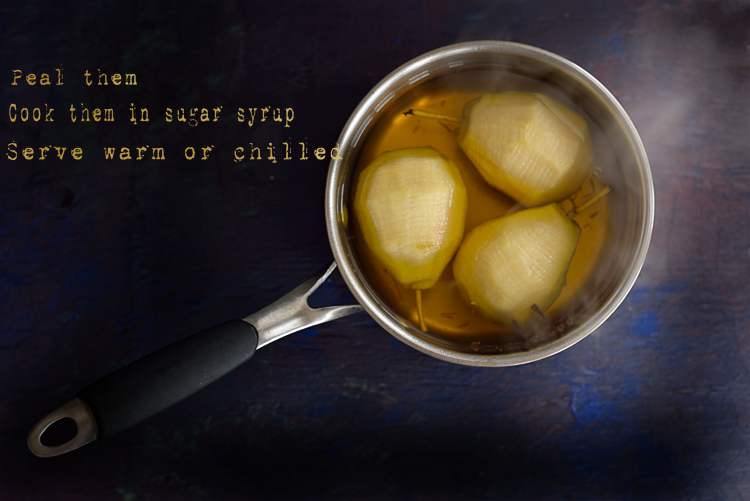 Wash and peal the pears, and cook them in the sugar syrup till they are tender and done. You can also use slow cooker to make these pears, if you are making for a large number of people or for the holidays, slow cooker is the way to go. It takes about an hour or more depending on the pears, when I tried it this summer it took me an hour and 40 min and the pears were very firm. Since This time I was making a small batch I did the old-fashioned stove top way. On stove top it takes about 20-30 min, on high heat. Remove from sugar syrup, keep aside. Cut the mango and pulp it with 2 tbsp half and half. Add the saffron, sugar and chili powder and bring to boil, if not to thick add1/4 tsp of corn starch ( mixed with wanter). Let it cool, not make sure the sauce is chilled when you serve. 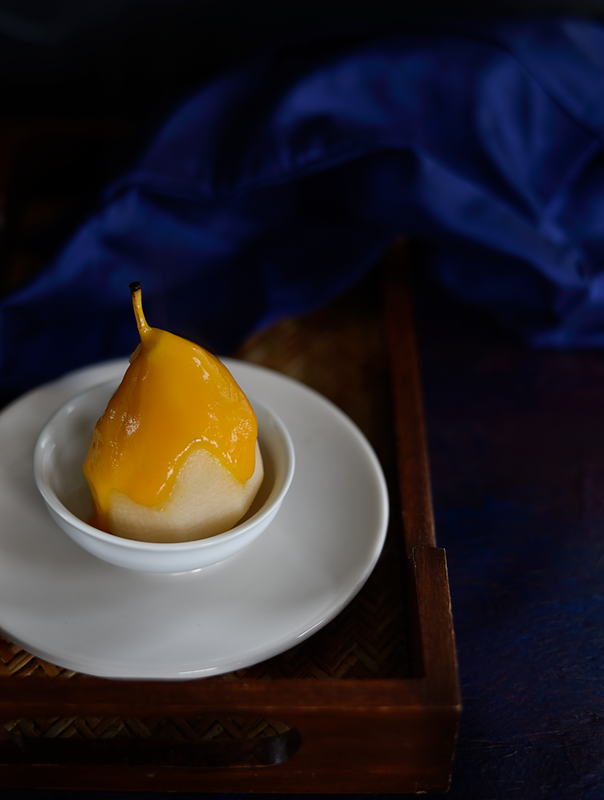 Take the poached pear and serve with mango sauce, you can serve the pears warm or chilled. Add some vanilla ice-cream (optional). 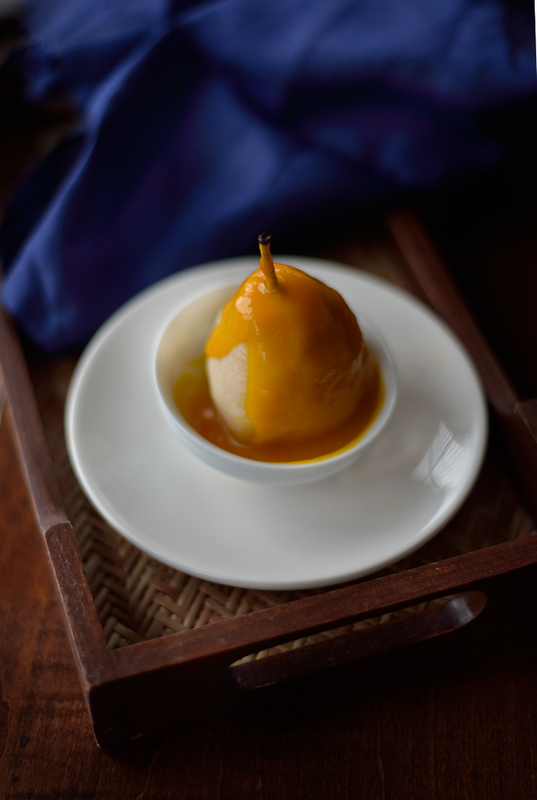 The flavor of saffron is just perfect with the pears….. It’s a great holiday recipe. The red chili just kicks the flavor to the next level.Try it for the holidays this year. Exquisite! This is a wonderful dessert. I particularly love the second picture. 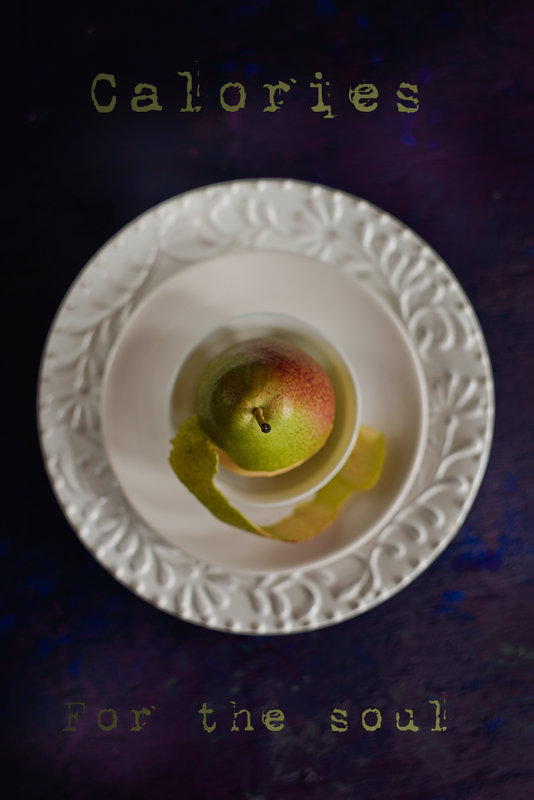 Poached pears are always a delicacy I like to devour. A delightful fruit dessert, Simi. The props are soo well chosen and the caption too :) love ! Perfect time of the year to present a dessert llike this one. I think pears are underused in recipes. Matching it with mango sauce is in inspired idea. Now I have to go back up the page and line to your photo pages. That's one delightful dessert. Love it. And Congrats on the portfolio Simi. 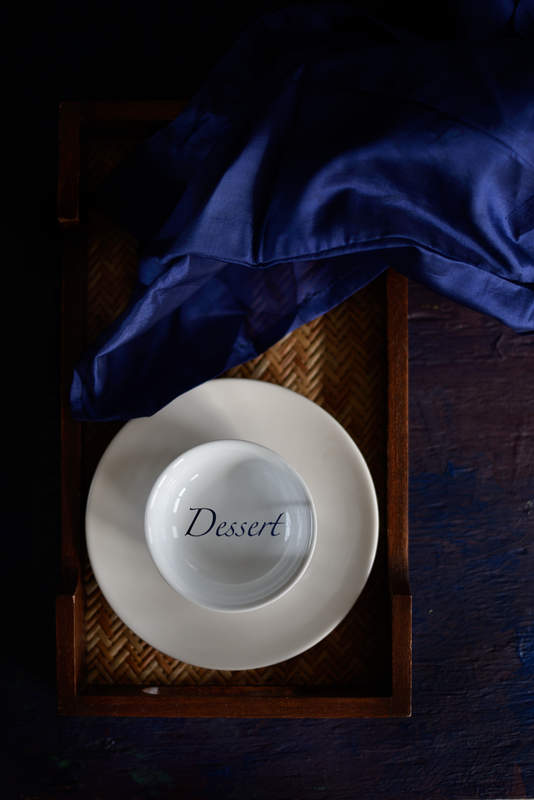 Love the way you use royal blue, dark red in your images. Very gutsy and ambitious! Tremendously BEAUTIFUL photos here, as always.